Chronic lung disease (CLD) of prematurity is a major problem of neonatal care. Bacterial infection and inflammatory response have been thought to play an important role in the development of CLD and steroids have been given, with some benefit, to neonates with this disease. 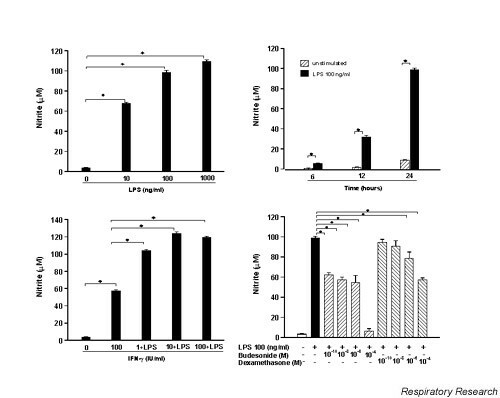 In the present study, we assessed the ability of lipopolysaccharide (LPS) to stimulate rat alveolar macrophages to produce nitric oxide (NO), express inducible nitric oxide synthase (iNOS) and activate nuclear factor-κB (NF-κB) in vitro. In addition, we investigated the impact of dexamethasone and budesonide on these processes. Griess reaction was used to measure the nitrite level. Western blot and a semi-quantitative RT-PCR were performed to detect iNOS expression. Electrophoretic mobility shift assay (EMSA) was performed to analyze the activation of NF-κB. We found that LPS stimulated the rat alveolar macrophages to produce NO in a dose (≥10 ng/ml) and time dependent manner (p < 0.05). This effect was further enhanced by IFN-γ (≥10 IU/ml, p < 0.05), but was attenuated by budesonide (10-4–10-10 M) and dexamethasone (10-4–10-6 M) (p < 0.05). The mRNA and protein levels of iNOS were also induced in response to LPS and attenuated by steroids. LPS triggered NF-κB activation, a mechanism responsible for the iNOS expression. Our findings imply that Gram-negative bacterial infection and the inflammatory responses are important factors in the development of CLD. The down-regulatory effect of steroids on iNOS expression and NO production might explain the beneficial effect of steroids in neonates with CLD. Chronic lung disease (CLD) of prematurity, previously described as bronchopulmonary dysplasia by Northway and co-workers in 1967 , is a prolonged respiratory illness often needing long-time care such as prolonged ventilation, with up to one years oxygen dependency. The definition of CLD was later modified to encompass all forms of acute pulmonary injury during the first week of life, leading to a dependency on supplemental oxygen at a later stage (36 weeks of postconceptional age). The etiology of CLD is multifactorial and not fully understood. The development of CLD is characterized by an initial increase of inflammatory cells  and mediators [3, 4]. Extensive release of proinflammatory cytokines, lipid mediators and other inflammatory mediators in neonates seems to play an important role in the maintenance of the inflammatory response in premature infants [2, 5]. During later phases there is a dominance of lung fibrosis. Administration of steroids to infants with CLD, or those at high risk of developing CLD, leads to an improvement in pulmonary mechanics and gas exchange facilitating the discontinuation of mechanical ventilation and possibly reducing the duration of oxygen therapy and the incidence of severe CLD . Nitric oxide (NO) is generated from L-arginine by three different NO synthases. Of these, two are constitutive isoforms; the third, inducible and Ca2+-independent NO synthase (iNOS), is expressed only following transcriptional activation of its gene [7, 8], as in acute and chronic inflammation . Biosynthesis of NO protein and iNOS mRNA has been increasingly recognized as an important intra- and intercellular messenger molecule in vascular relaxation, platelet activation and immune response  in human mononuclear cells. It plays important roles in the pathogenesis of Gram-negative septic shock and other infectious diseases . High levels of NO produced by iNOS can mediate lung injury . Laboratory studies have suggested that NO can potentiate lung injury by promoting oxidative or nitrosative stress , inactivating surfactant, and stimulating inflammation . NF-κB is a ubiquitous transcription factor that is responsible for the gene expression of, for example, cytokines, chemokines, growth factors, cell adhesion molecules and some acute phase proteins. There are five mammalian NF-κB family members which include NF-κB1 (p50/p105), NF-κB2 (p52/p100), p65 (RelA), RelB, and c-Rel . Infectious agents, predominantly Gram-negative bacteria, are thought to be one of the major causes of neonatal lung injury [2, 16]. We therefore hypothesized that lipoplysaccharide (LPS), the major component of Gram-negative bacteria, activates alveolar macrophage NF-κB, induces expression of iNOS and increases NO production. We investigated whether steroids could attenuate this inflammatory response. A rat alveolar macrophage cell line (ATCC 8383, Rockville, Maryland, USA) was maintained in Ham's F-12 medium (GibcoBRL, Gaithersburg, MD, USA) and supplemented with 15% heat-inactivated fetal bovine serum (GibcoBRL). The limulus amebocyte lysate (LAL)(Charles River Endosafe, SC, USA) test in the reagents showed that the endotoxin level was less than 10 pg/ml. Rat alveolar macrophages were distributed into 24 micro-well plates at a concentration of 1 × 106 cells/ml in serum and phenol free medium and stimulated with 10–1000 ng/ml of LPS, O55:B5 (Sigma, St. Louis, Missouri, USA) or in combination with 1–100 IU/ml IFN-γ (Genzyme, Cambridge, MA, USA) for 24 hours at 37°C with 5% CO2. To evaluate the role of steroids, rat macrophages were incubated with 100 ng/ml of LPS in the presence of dexamethasone (10-4–10-10 M) or budesonide (10-4–10-10 M). All the supernatants were collected after stimulation and stored at -70°C for analysis of NO. The accumulation of NO2 -, a stable end product of NO formation, in conditioned media was measured as an indicator of NO production. 100 μl cell-free conditioned medium was incubated for 10 min with 100 μL Griess reagent at room temperature and the absorbance at 540 nm was measured in a microplate reader. NO2 - in the samples was calculated from a standard curve of sodium nitrite. Macrophages were lysed with Laemmli sample buffer and denatured by boiling for 5 min. The protein concentration was determined using a bicinchonic acid kit (Pierce, Oud Beijerlands, The Netherlands). For western blot analysis, 10 μg of protein per lane was separated on 7.5% SDS-polyacrylamide gels, and electroblotted on hydrophobic polyvinylidene difluoride (PVDF) membranes (Amersham, Buckinghamshire, UK). The membrane was blocked in 5% non-fat dry milk dissolved in TTBS (Tween tris buffered saline) (150 mM NaCl, 10 mM Tris-HCl and 0.1% Tween-20, pH 7.4), and subsequently incubated for 1 hour at room temperature with a monoclonal antibody against macrophage iNOS (Transduction Lab, Lexington, KY, USA), followed by incubation for 1 hour with horseradish peroxidase-conjugated sheep anti-mouse Ig F(ab') fragments (Amersham). Immunoreactive bands were visualized using an enhanced chemiluminescence kit (Amersham). Total RNA was extracted from cells with RNAzol™B (Biotecx Laboratories, Houston, TX, USA), after the different treatments, according to the manufacturer's instructions. First strand cDNA synthesis of total RNA was performed using SuperScript RNase H- Reverse Transcriptase (GibcoBRL) and random hexamer primers (pd(N)6; Amersham Pharmacia Biotech, Uppsala, Sweden). Specific oligonucleotide primers were synthesized for rat iNOS (Clontech, Palo Alto, CA, USA). The sequences of the 3'- and 5'-primers used were CCCTTCCGAAGTTTCTGGCAGCAG and GGGCTCCTCCAAGGTGTTGCCC . The rat G3PDH primers were obtained from Innovagen (Lund, Sweden). The sequences were CTCAAGATTGTCAGCAATGC and CAGGATGCCCTTTAGTGGGC . The PCR using Taq polymerase (final concentration 0.025 U/μl; GibcoBRL) was performed at a final volume of 25 μl containing 2 μl of cDNA for iNOS and G3PDH in a DNA Thermocycler 480 (Perkin Elmer, Norwalk, CT, USA) for 33 cycles for rat iNOS under the following conditions: 1 min denaturation at 94°C, 1 min annealing at 60° and 2 min extension at 72°C. PCR was conducted for rat G3PDH for 1 min at 94°C, 1 min at 60°C and 1 min at 72°C. The PCR products were separated on a 1.5 % agarose gel (GibcoBRL). The ethidium bromide stained gel was photographed under UV-light with the DC120 Digital Zoom Camera (Eastman Kodak Company, Rochester, NY, USA) and the net intensities of the PCR products were analyzed with the Kodak Digital Science™ Electrophoresis Documentation and Analysis System 120 (Eastman Kodak). Cells grown in serum-free medium were stimulated with 4 × 108 CCU/ml of LPS for 30 min or preteated with dexamethasone (10-4 M) or budesonide (10-4 M) for 1 hour. Nuclear extracts were prepared as described  and nuclear protein concentrations determined using the BCA (bicinchoninic acid) method (Pierce, Rockford, IL). The nuclear extract (3 μg of protein) was preincubated for 10 min in the reaction buffer (10 mM HEPES, pH 7,9, 10% glycerol, 60 mM KCl, 5 mM MgCl2, 0.5 mM EDTA, 1 mM DTT, 1 mM phenylmethylsulfonyl fluoride (PMSF) and 2 mg poly (dI-dC)) (deoxyinosinate-deoxycytidylate) followed by incubation for 30 min at room temperature with 50,000 cpm of 32P-labeled NF-κB probe (double-stranded oligonucleotides containing an NF-κB consensus binding site: 5'-AGT TGA GGG GAC TTT CCC AGG C-3', [Promega, Madison, WI, USA]). After 30 min at room temperature, samples were separated on 4% native polyacrylamide gels in low ionic strength buffer (22.3 mM Tris-borate, 0.5 mM EDTA, pH 8). Dried gels were autoradiographed with intensive screens at -80°C. In some cases, the incubation of nuclear extracts with 32P-labeled NF-κB probe was performed in the presence of 25 and 50 times excess unlabeled NF-κB probe or unlabeled irrelevant oligonucleotide probe for AP-1 (Promega). For supershift analysis, rabbit anti-p50 and anti-p65 polyclonal antibodies (Santa Cruz Biotechnology, Santa Cruz, CA) were incubated with the nuclear extracts for 15 min prior to the addition of radiolabeled probe. Data from pooled experiments were reported as the mean nitrite concentrations ± the standard errors of the means (SEMs). Data were analyzed by one-way ANOVA test followed by Newman-Keuls test for two mean comparisons. A P value of less than 0.05 was considered to be significant. After treatment with LPS, the alveolar macrophage produced NO in a dose and time dependent fashion (Fig. 1A &1B). LPS at concentrations ≥10 ng/ml induced the production of NO (p < 0.05) at 24 hours. This effect could be further enhanced in the presence of IFN-γ (10–100 IU/ml, p < 0.05) (Fig. 1C). The induced NO production could be detected in the conditioned media after 6 hours stimulation with LPS and reached peak levels at 24 hours in our time setting. Since iNOS is regulated mainly at the transcriptional level, we further checked iNOS transcripts by a semi-quantitative RT-PCR. Abundant iNOS mRNA was found in the LPS stimulated cells at 24 hours compared to untreated cells (Fig. 2). 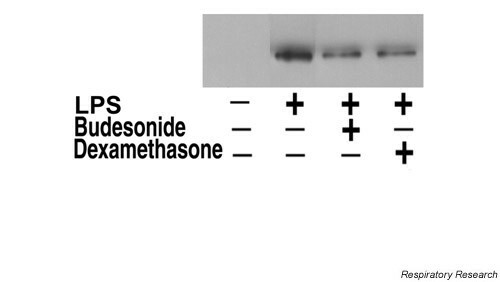 The protein of iNOS showed the same pattern in the LPS stimulated cells determined by western blot (Fig. 3). A. LPS induced NO production by alveolar macrophages. Macrophages were stimulated with LPS (10–1000 ng/ml) for 24 hours. B. Kinetics of NO production by macrophages in response to and LPS (100 ng/ml). C. LPS (100 ng/ml) in combination with IFN-γ (1–100 IU/ml) in macrophages. D. Downregulation of LPS (100 ng/ml) stimulated NO production in the rat alveolar macrophage cell line by different doses of budesonide and dexamethasone. NO production was assessed by determining NO2 - concentration in conditioned medium. LPS = lipopolysaccharide; IFN-γ = gamma interferon. The effect of LPS on the NF-κB signal tranduction pathway in alveolar macrophages was determined by EMSA. After treatment of macrophages with LPS for 30 min a substantially enhanced NF-κB binding complex was observed in the nuclear extract of macrophages (Fig. 4). The specificity of the NF-κB-DNA complex was ascertained by competition study. As shown in Fig. 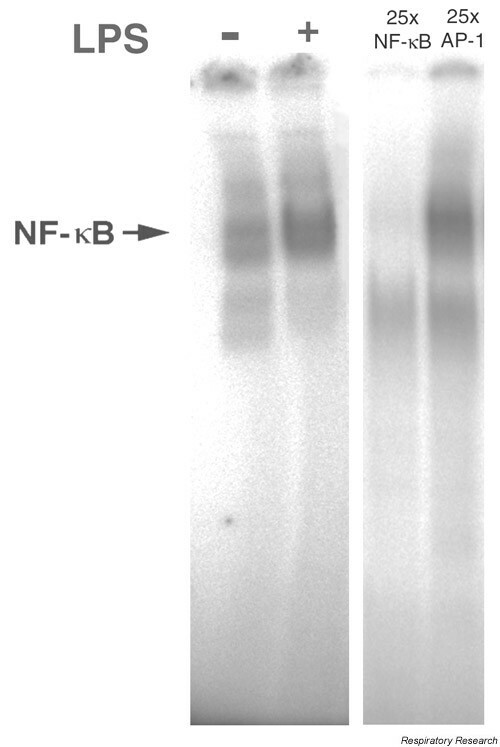 4, the indicated NF-κB-DNA complexes were substantially removed by adding an excess of cold NF-κB probe but were not affected by adding excess unlabelled AP-1 probe. We demonstrated that LPS could trigger rat alveolar macrophages to express iNOS and thus produce NO in a dose and time-dependent fashion. This induction was significantly enhanced in the presence of IFN-γ and inhibited by steroids. Moreover, LPS was capable of activating NF-κB. Clinical studies have suggested that NO is an important inflammatory mediator in several human infections especially in fulminant early-onset neonatal pneumonia , sepsis and Leishmania infantum infection [21–23]. Likewise, monocytes and tissue macrophages isolated from patients with rheumatoid arthritis, tuberculosis and malaria display higher levels of iNOS and generate increased levels of NO in vitro. It is known that there are species differences of NO production. Weinberg  has reviewed the reports from 1989 to 1998 regarding NO production and iNOS expression in human mononuclear phagocytes where there were some difficulties in detecting NO production, partly depending on the method used. Rodent mononuclear phagocytes have been used for many in vitro studies [24, 25], mainly because they seem to be more sensitive. NF-κB is known as a widespread rapid response transcription factor expressed in a variety of cells . Both endogenous and exogenous stimuli induce NF-κB activation. The role of NF-κB in iNOS gene expression has been well elucidated . Using transfection techniques Xie and colleagues showed that activation of NF-κB is an essential mechanism responsible for LPS – or oxidative stress-induced NO production in mouse macrophages . Our data demonstrate that LPS is a potent activator of NF-κB in rat alveolar macrophages, as evidenced by its rapid and intense NF-κB activation. This indicates that NF-κB activation may be of great importance for the LPS induced iNOS expression in our study. In addition, the potential role of NF-κB in inflammation and immune modulation in Gram-negative bacterial infections is not limited to transcriptional activation of iNOS. In fact, it has been shown that NF-κB plays a crucial role in the inducible expression of many inflammatory genes encoding transcriptional factors, adhesion molecules, cytokines and growth factors . Therefore, LPS induced NF-κB activation in macrophages may represent a key mechanism responsible for the inflammatory reaction that is important in the development of CLD caused by Gram-negative bacteria. Although the physiologic production of NO plays a key role in host defense against various intracellular pathogens, its overproduction may be responsible in part for the pathophysiology of infection . Overproduction of NO is likely to contribute to the hemodynamic instability in overwhelming sepsis in humans . Animal studies suggest that the high-output NO pathway is responsible for escalating the inflammatory response . When the production of NO is left unattenuated, especially under oxidative stress, direct cytotoxic effects of NO can emerge through the formation of peroxynitrite, as a result of a reaction between NO and superoxide , which is an important mediator of tissue injury and organ dysfunction . The oxidative stress, DNA damage and disruption caused by excess NO can lead to cell death by apoptosis or necrosis . It is thus likely that when the preterm infant is infected with bacteria in the lungs, alveolar macrophages and lymphocytes will infiltrate and result in elevated levels of NO, cytokines such as TNF-α, IL-6 and IL-8 [5, 33–35] and other inflammatory mediators, which may lead to lung tissue injury and fibrosis. Inhibiting high-output NO production by blocking iNOS expression/activity may be a useful strategy in the treatment of inflammatory disorders such as CLD. 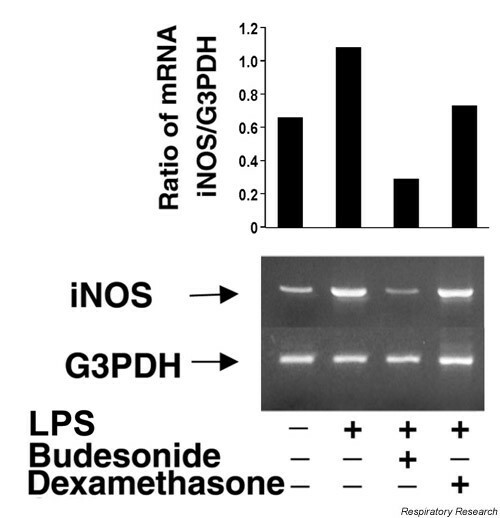 We have shown that both budesonide and dexamethasone can down-regulate iNOS expression causing decreased NO production at the inflammatory site. This can perhaps partly explain why steroids have a beneficial effect in the treatment of CLD in neonates. It seems that steroids have a stronger effect on NO production than on iNOS mRNA expression. The observed difference could be caused by the influence of steroids on different steps. One is to inhibit iNOS at the transcription level through inactivation of the NF-κB pathway. Steroids may also have a direct effect on iNOS protein expression and further influence the NO production. Our study showed that LPS activates NF-κB, induces the iNOS expression and further enhances the NO production in macrophages, which might imply that Gram-negative bacteria are important etiological factors in the development of CLD. This study was supported by Stiftelsen Frimurare Barnhuset, the Funds of Karolinska Institute, Magn. Bergvalls foundation, Stiftelsen Sven Jerrings Fond, Sällskapet Barnavård Foundation, the Swedish Medical Research Council (project 6816), the Swedish Heart-Lung Foundation (199941318) and Tore Nilsson Foundation.